WASHINGTON - President Barack Obama said Thursday that officials at the "highest levels" of the Iranian government must be held accountable for a brazen and bizarre plot to assassinate the Saudi ambassador to the United States on American soil, insisting leaders of the world will believe the U.S. case without dispute once they absorb the details. U.S. officials, meanwhile, confirmed the Obama administration has had direct contact with Iran over the allegations. The U.S. ambassador to the United Nations, Susan Rice, met with Iranian officials at Iran's mission to the U.N. on Wednesday  a highly unusual contact for two countries that do not have diplomatic relations. Obama would not say whether Iran's supreme leader, Ayatollah Ali Khamenei, or its president, Mahmoud Ahmadinejad, knew of the alleged plan. Yet he called it part of a pattern of "dangerous and reckless behavior" by the Iranian government and said people within that government were aware of a murder-for-hire plot. The U.S. considers it an attempted act of terrorism. "We believe that even if at the highest levels there was not detailed operational knowledge, there has to be accountability with respect to anybody in the Iranian government engaging in this kind of activity," Obama said in a news conference tied to the state visit of South Korean President Lee Myung-bak. 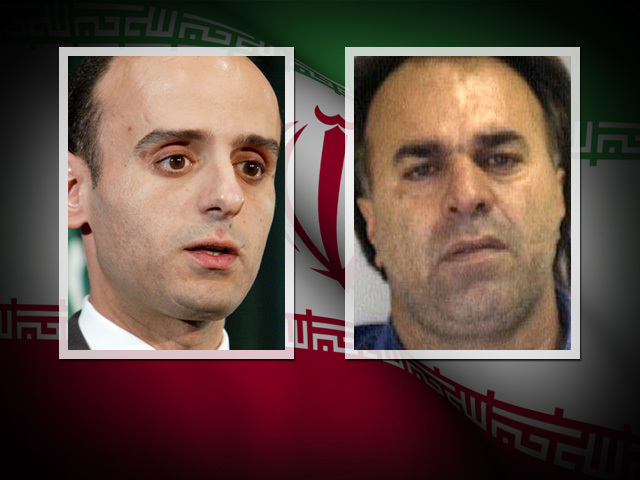 Friend: Iran plot suspect "no mastermind"
Iran has vehemently denied anything to do with the alleged plot to kill the Saudi envoy to the United States, Adel Al-Jubeir, at a Washington restaurant. U.S. officials have described it as a remarkably clumsy but deadly serious operation by Iran's elite foreign action unit, the Quds Force. Two men were charged in New York federal court Tuesday for allegedly trying to hire a purported Mexican drug cartel member to carry out the assassination with a bomb attack. Obama is seeking a vigorous response from around the world, on top of increased sanctions and pressure against Iran from the United States itself. U.S. diplomats have given their host governments information about the foiled plot. The U.S. criminal complaint says the Iranian plotters hired a would-be assassin in Mexico who was a paid informant for the U.S. Drug Enforcement Administration and told U.S. authorities all about their plot. "We've laid the facts before them," Obama said of world leaders. He said once they analyze them, "there will not be a dispute" over what happened. That State Department conceded Thursday that the response from foreign governments was initially skeptical. "When you look at these details, it seems like something out of a movie," said department spokeswoman Victoria Nuland. "And that's always the first reaction. That was the first reaction when this effort was briefed to some senior folks in this government," she said. "But as you begin to give more detail on what we knew and when we knew it and how we knew it, it has credibility." At the United Nations, American allies said the U.S. evidence of an Iranian plot was convincing, but Russia and China reacted with caution. Rice briefed top envoys from the 14 other Security Council nations Wednesday. Allies said the evidence she presented clearly showed the involvement of Iranian officials  but left unanswered the question of whether Iran's top political and religious leaders knew about the plot. "It's very credible and very convincing," France's U.N. Ambassador Gerard Araud told reporters Thursday. "Obviously, there were officials in Iran who were behind the plot, but I don't know to which level." Clinton: Iran plot a "dangerous escalation"
But Russian and Chinese diplomats reacted cautiously when asked whether they found the evidence presented by Rice and other U.S. officials to be credible. "The Obama administration is going to have to pursue tough actions against Iran for its role in the alleged assassination plot from the U.S. Treasury Department and by European allies, because Security Council action against Iran is unlikely unless the Russian Federation changes its position of strong support for Tehran," said CBS News Foreign Affairs Analyst Pamela Falk, from the U.N.
"Moscow made clear, since the complaint was filed, that it stands by Iran and will not impose a fifth round of sanctions," Falk reports. "That leaves the Obama administration without U.N. Security Council support." Obama made the case that Iran is acting outside all norms of international behavior and that, in turn, it finds itself increasingly isolated. He said with that every violation, the United States and its allies will make sure Iran's leaders "pay a price." In a standard allusion to military intervention, Obama said that he would remove no option of U.S. response but that the focus was on diplomatic pressure. Lee raised the subject himself at the news conference with Obama, saying that he was "deeply shocked" and that the Korean people condemn all forms of terrorism. Secretary of State Hillary Rodham Clinton and other U.S. officials say the alleged plot is more evidence that Iran is the world's leading state sponsor of terrorism, a label Washington has for decades applied to the Iranian government. The officials also say it underscores concerns that despite its denials Iran is trying to develop nuclear weapons under cover of a civilian atomic energy program. In London, British Foreign Secretary William Hague told lawmakers that Britain was working with the U.S., Saudi Arabia and others to agree on a tough international response. In Vienna, Saudi Arabia's foreign minister accused Tehran of "murder and mayhem" and said his country was working on a "measured response" to the alleged Iranian attempt to assassinate Riyadh's ambassador. Other European nations also called for action over the alleged plot. Germany's Foreign Minister Guido Westerwelle has demanded an explanation from Tehran over the alleged plot, the country's Foreign Ministry said in a statement. "Indications of the involvement of Iranian government agencies cause even greater concern," the ministry said. "The federal government calls upon the Iranian government for a comprehensive explanation of the allegations. Those who took part in the attack plans and their backers must be held accountable."